​Much of the recent criticism levelled at Arsenal has been aimed at the lack of depth and stability in the defensive areas of the squad. ​Djene made the move to Segunda División side AD Alcorcon where he grew to be a prominent figure in the team. After two years in the Spanish second tier he earned a move to Belgian top flight side Sint-Truidense. In July 2017, it was a return to Spain for the defender, this time signing for ​La Liga side Getafe. ​Djene has continued his excellent form this campaign after his debut season in La Liga last term. ​Arsenal fans should be aware that Djene's performances have helped Getafe go unbeaten in seven league matches with the third best defensive record in La Liga, conceding fewer goals than Spanish giants ​Real Madrid and ​Barcelona this season. ​Djene claimed the captain's armband for the first time when Barcelona visited Estadio Coliseum Alfonso Pérez in January this year. Despite a 2-1 defeat to the reigning champions, Djene has regained captaincy on a further two occasions against Eibar and Huesca with his side earning a draw and a win respectively. ​He has also become the captain of his national team Togo in recent games. During his last two appearances for the Sparrowhawks, Djene captained the team to pick up four points against Gambia in their Africa Cup of Nations 2019 qualifiers. ​Djene has also racked up plenty of experience at international level. He has been a consistent member of the Togo national team since gaining his first cap against Gabon in 2012. The defender now has 34 caps for his country and has captained the team on four occasions. ​Togo are currently in contention to qualify for the African Cup of Nations 2019. Djene will be part of the squad that needs to beat Benin on March 22 to make sure they qualify for this summer's competition. Former Arsenal player and Togo legend Emmanuel Adebayor has also been called up to the squad. ​It is no surprise to see the 27-year-old linked with a move away from Estadio Coliseum Alfonso Pérez after his impressive performances during his two year spell at the club. However, any club snooping around will need to be aware of his €35m release clause. Djene was signed for a fee of only €2.5m from Sint-Truidense but Getafe club president Angel Torres told Cadena Cope (via ​Football London) that they are willing to sell him for less than the his release clause. ​With ​Arsenal barely spending money in the past two transfer windows, the price may put off the Gunners, but with the side's new agreement with adidas, funds could become available for Djene's transfer. ​Djene’s performances in La Liga have not gone unnoticed by the bigger teams in the league. 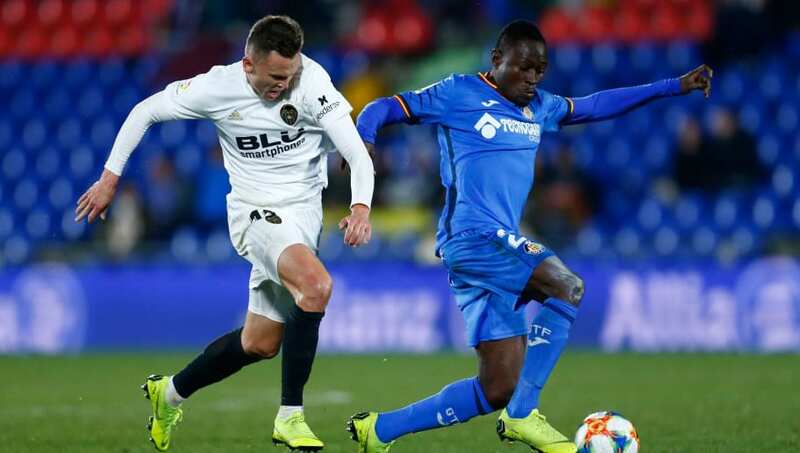 Getafe could well be playing Champions League football next season should they continue their current push up the table, though Djene could be attracted to a move away to a bigger club should they come calling. As reported by ​Football Espana last year, Djene said: "I’m hopeful my work can take me to a bigger club." A year later, the performances Djene has produced may help him earn a major move to one of Europe's biggest team.